The JC Raulston Arboretum’s collection of redbuds (Cercis) is one of the most comprehensive in North America. In 2008, the collection was recognized by the North American Plant Collection Consortium (NAPCC) and officially designated a national collection. The NAPCC is a network of botanical gardens and arboretums coordinating a continent wide approach to plant conservation and plant collections management. In this program, institutions commit to holding and developing a collection of documented living plants. 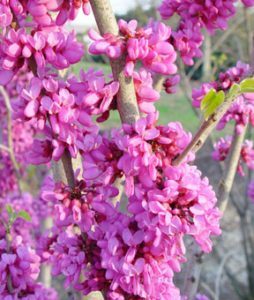 The redbud has been an important part of the collections of the JC Raulston Arboretum (JCRA) from the start, with the first one dating to 1978 shortly after the Arboretum was established. While most public gardens have their share of redbuds, few have as significant a collections of the often hard to find species and cultivars as the Arboretum. The Arboretum currently holds seven species and 40 distinct taxa. Redbuds are widely distributed throughout the northern hemisphere with species occurring throughout eastern and southwestern United States, Mexico, Asia, southern Europe, and parts of the Middle East. The Arboretum’s collection contains species from all of these regions with a special emphasis on our native eastern redbud (Cercis canadensis). Wherever they are found, redbuds are cherished for their cheerful spring flowers in shades of pink and white and their distinctive heart-shaped leaves. By the mid 1990’s, two selections of redbuds had been selected and named by Dr. J.C. Raulston. The first, ‘Bonita’ (Cercis canadensis subsp. mexicana), was grown for it’s exceptionally glossy leaves. The other, ‘Celestial Plum’ (C. glabra, synonym C. yunnanensis) was selected for its blue-green foliage and loads of light plum purple flowers in early spring. Once thought to be lost from cultivation, this outstanding selection is making a resurgence. In more recent years, the JCRA Cercis collection has been used as source material in the breeding efforts of Dr. Dennis Werner, plant breeder in the Department of Horticultural Science at NC State University. He has released several new plants in conjunction with the JCRA. Exciting plants that have emerged from this innovative breeding program include weeping forms with both variegated (‘Whitewater’) and purple leaves (‘Ruby Falls’), as well as the purple leafed ‘Merlot’ (Cercis canadensis subsp. texensis). The newest introduction from the Arboretum is a Cercis chinensis. It is one of the first redbuds in the extensive collection to show color, covering itself in lavender-pink flowers, and is one of the last to finish flowering. The exuberant flower display starting at the very beginning of March and continuing through the end of April gives us the hope of returning spring and ushers in the “March Madness” of our garden’s floral display. To honor the memory of NC State Women’s Basketball Coach Kay Yow, this exceptional plant was named after her – ‘Kay’s Early Hope’ (C. chinensis).